My family is awesome. This was the first weekend where chores were part of the agenda. Sure we’d clean up stuff here and there on other weekends – but this weekend we had “The Chore Hour.” The kitchen timer was set for one hour. For 60 minutes the four of us were to be as busy as bees getting as many chores done as we could. 1. If you saw something that needed cleaning, picked up, or organized, do it. 2. 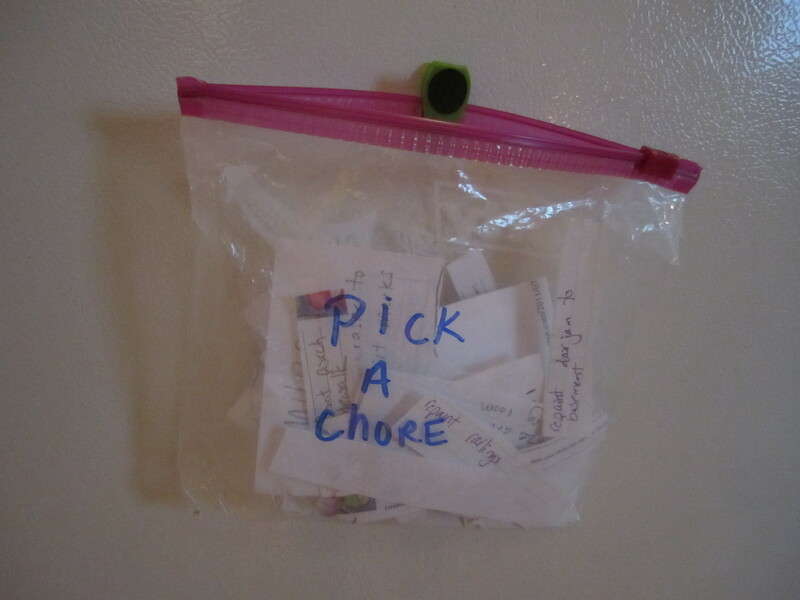 If you don’t see anything then pull a chore from the chore bag. In the hour that we were all working this is what got done: dishwasher loaded and running, a sink full of dishes washed, kitchen counters wiped off, table wiped off, front porch and sidewalk swept, back patio swept, all scuff marks Magic Erased off of walls, baseboards in living room and dining room dusted, load of laundry folded and put away, 3 toilets cleaned, 3 bathroom sinks cleaned, and 3 bathroom mirrors cleaned. And really – it wasn’t even all 4 of us. My man was out on a run when we started so he didn’t even participate. All those chores got done by myself and the two munchkins (who are just 6 and 7). Little Miss did pitch a bit of a fit when Buddy got to Magic Erase the walls – I guess that is a “fun” chore. All was better when I suggested to her that she could clean the toilets. She was seriously excited to do this! I happened to walk past the bathroom as she’s wiping away and she exclaims, “I LOVE CLEANING TOILETS!” We did another 30 minutes on Sunday just for fun and got even more stuff done! I just hope we keep it up. Now time for some fun kid quotes. I was bending down in front of Buddy tying his shoes. He was swooshing my hair all around and I say, “are you making me look like a pretty mom?” and he answers, “you look like a mom that doesn’t own a comb.” So much for my beach hair look. I was lucky enough to sub in a kindergarten classroom last week. Pre-kids, when I was a full-time 8th grade science teacher, never in a million years would I have thought being with kindergarteners would be OK. I guess after living with a couple of them I understand five much better. I laughed all day. They just say awesome stuff. Here’s my favorite quote of the day. We were in the computer lab and the kids were doing a program where they had to create the letters of the alphabet. Some kids were zipping along and others were struggling a bit. I said to a few kids who were moving through without much problems, “you guys are really on a roll.” A few minutes later I over hear a little girl say to the boy next to her as she was working, “I’m doing a roll!” I smile just thinking about the cuteness. I think my family did a roll this weekend and while nothing will get done next weekend (it’s camping season for us!) at least for now I have 3 clean toilets.